Warning: This review contains two minor spoilers. I first read Ray Bradbury’s ‘Fahrenheit 451’ (1953) in the tenth grade. 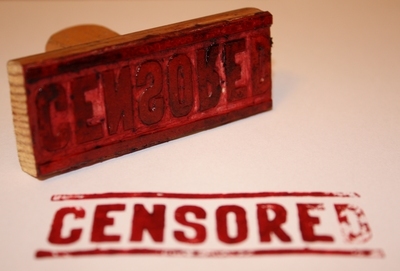 Even then I appreciated Bradbury’s concerns regarding censorship and the dangers of ignorance. But now, faced with the impending extradition of the world’s most daring whistle-blower, Julian Assange, I fear I understand Bradbury’s concerns with a renewed and intensified horror. 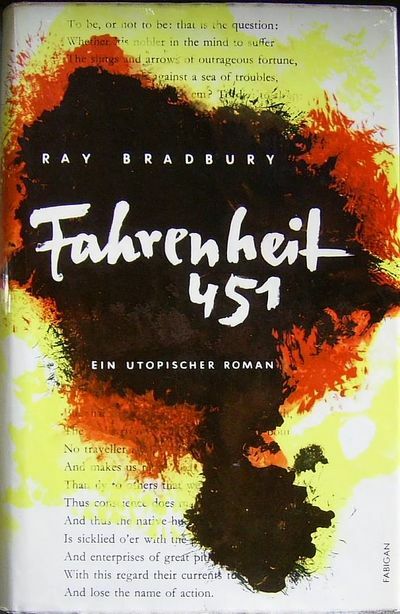 Bradbury’s 1953 text centres on a dystopian world in which books are altogether prohibited and people distract themselves with inconsequential nonsense. 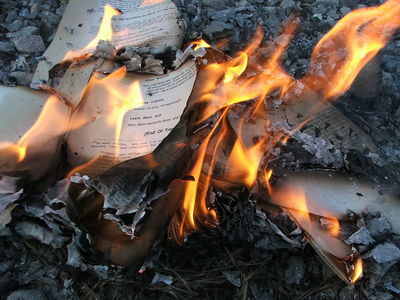 In a similar way, we often amuse ourselves with nonsensical rubbish while books like Fahrenheit 451 make their way to ‘Banned Books’ lists around the world. Throughout his text, Bradbury explores the very real dangers of censorship, apathy, blind conformism, and ignorance by confronting us with a society in which ‘every man is made equal’. The ruling power’s perverse desire to control the masses is realised primarily through the proscription of literature – a ‘treacherous weapon’ that evokes independent thought, curiosity and doubt. Introduced to us as an almost-corpse, Mildred Montag, the wife of Bradbury’s protagonist, is a character quite content to embrace the ignorance that is thrust upon her. Instead of engaging her husband, Guy, in heartfelt and meaningful ways, Mildred appears concerned only with the relationships she has with televised fictional characters. In fact, Mildred spends her days studying television scripts so she can partake in the fictional worlds that are projected onto parlour walls from the confines of her own home. Mildred’s character suggests to us that all that glitters is not gold as she makes an attempt on her life in the novel’s orientation. In this way, Bradbury confronts us, from the very beginning of his text, with a graphically compelling message to live authentically as we journey through life. Like Mildred, the majority of people in Bradbury’s storyscape unwittingly embrace their own oppression. However, a hopeful minority struggle, resolute in the preservation of mankind’s greatest achievement – the written word. 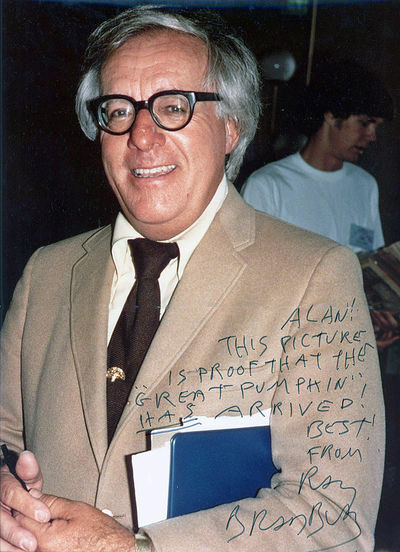 Ray Bradbury. This image was originally posted to Flickr by Alan Light. Sourced from Wikimedia Commons. Quite literally, a “fire man” charged with the responsibility of defending the status quo by burning books and the houses in which they are kept, our protagonist, Guy Montag meets a young woman. Clarisse McClellan, an ‘odd’ girl who ‘think too many things’, effectively personifies for us the importance of literature, intellectual freedom, and maintaining intimate relationships, which also form the basis of the novel’s thematic insights. Clarisse’s spirited nature haunts the stoic man until he cries out in desperation, ‘There must be something in books, things we can’t imagine’. It is this message that underpins Bradbury’s compelling narrative and Montag’s consequent journey. Ray Bradbury employs vivid imagery that excites the senses, well-rounded characters with which we can empathise, and thematic concerns central to our existence as human beings to create a narrative worth reading - a narrative worth censoring.